This research aimed to present the process of estimating bicycle traffic demand in order to design bike routes that meet the daily transportation needs of the people in Nakhon Sawan Municipality. 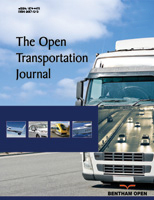 The primary and secondary traffic data were collected to develop a virtual traffic simulation model with the use of the AIMSUN simulation software. The model validation method was carried out to adjust the origin and destination survey data (O/D matrix) by running dynamic O/D adjustment. The 99 replication scenarios were statistically examined and assessed using the goodness-of-fit test. The 9 measures, which were examined, included: 1) Root Mean Square Error (RMSE), 2) Root Mean Square Percentage Error (RMSPE%), 3) Mean Absolute Deviation (MAD), 4) Mean Bias Error (MBE), 5) Mean Percentage Error (MPE%), 6) Mean Absolute Percentage Error (MAPE%), 7) Coefficient of Determination (R2), 8) GEH Statistic (GEH), and 9) Thiel’s U Statistic (Theil’s U). The resulting statistical values were used to determine the acceptable ranges according to the acceptable indicators of each factor. It was found that there were only 8 scenarios that met the evaluation criteria. The selection and ranking process was consequently carried out using the multi-factor scoring method, which could eliminate errors that might arise from applying only one goodness-of-fit test measure. Keyword: AIMSUN simulation model, Bicycle traffic demand, O/D matrix adjustment, Multi factor scoring method, MAPE, RMSE. © 2018 Chalermwongphan and Upala.